Party At The "Mavericks" House! 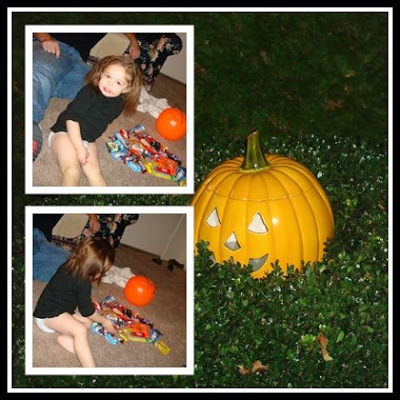 I completely forgot to blog our "grown up" Halloween party at Angela and Kevins house! It was so much fun...no kids, just us grown ups getting "mavericky" and being big dorks laughing are heads off at eachother. 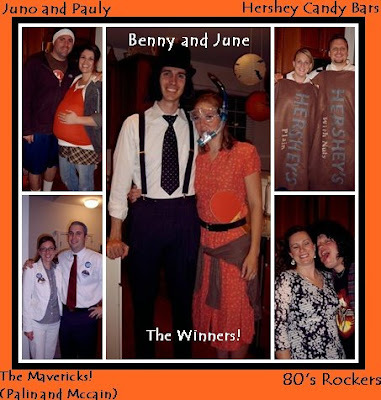 We had a best costume contest and Benny and June (Jenny and Jed) totally took the cake! Their costumes were awesome. Although the plain and with nuts candy bars were a close second! Miss Sarah Palin and MR. John Mccain were awesome hosts!!! Thanks guys. I realize it's the middle of November, but what do you do?! 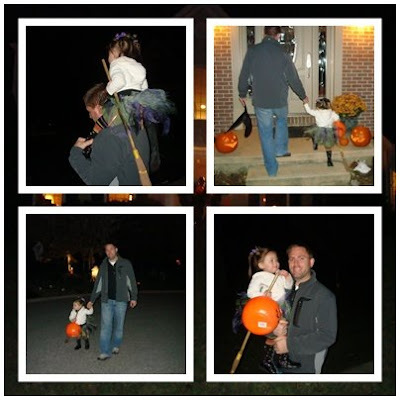 Halloween this year was awesome. It was like a week long event. 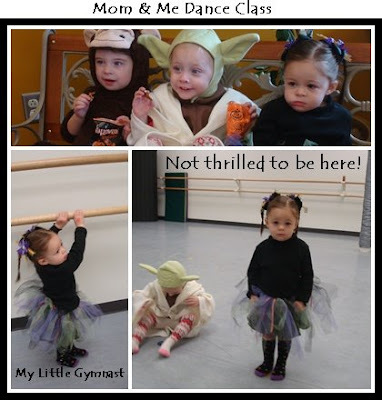 We started off with Trunk-r-Treating at the church and then went to a really fun "mom and me" dance class during the week with Leslie and Isabel/super cute Yoda! (You can tell by the pictures how thrilled Rani was to be there! She was, however, really excited about the bar to hang from. All these cute little girls doing plies and my child is hanging like a monkey. The poor lady kept having to tell her to get down, which is "Rani" for "what, you want to see me do it again?!" Next time we'll do a Mom and me gymnastics class!) Then we ended the week with an awesome night of - as Rani says - "chick 'r cheating" in the old neighborhood. Rani LOVED it. She is still talking about the "fun houses" and "knock uh door" and recapping who was what. 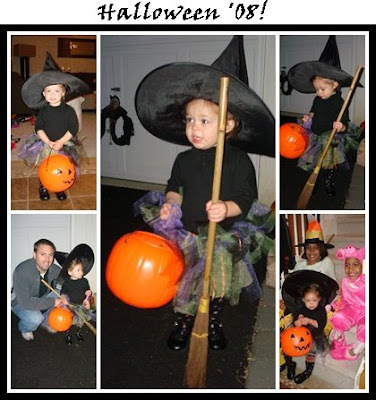 She insisted on carrying her broom and pumpkin-full of full size candy bars the entire night. The hat we barely got on her for a few pictures. It was a lot of fun, though. These holidays just get to more and more fun with Rani. Can't wait until Christmas!! !